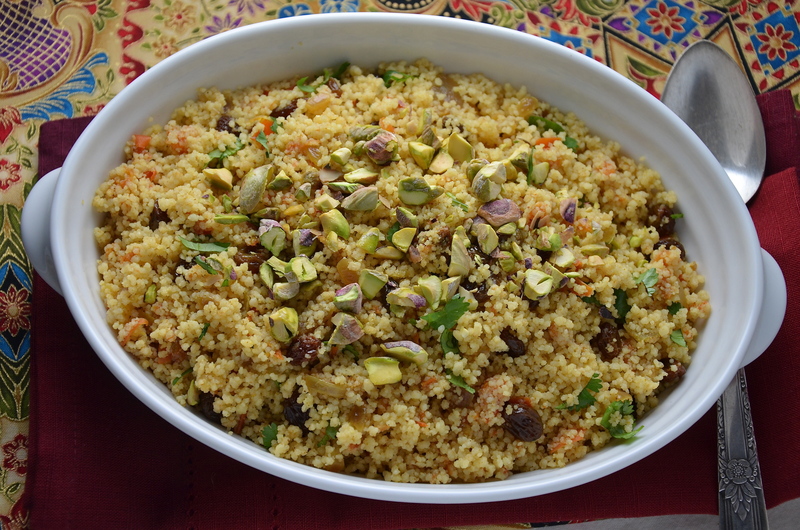 For the second recipe of my Moroccan series, I have decided to present a staple of North African cuisine, couscous. In countries all across the top of Africa and into the Middle East, one will find a large platter of fluffy couscous at the centre of most meals. The subtle flavour of couscous is perfect for sopping up sauces of the many savoury meat and vegetable dishes at a meal, much like rice in Asian cuisines. The difference being, couscous is actually a form of pasta, not a grain like rice. Today, most of the couscous we buy is “instant”, taking only 10 minutes to prepare, but the traditional “long-cook” couscous is done in a steamer called a “couscoussier” and takes about 45 minutes to prepare. I don’t know if my recipe is traditionally Moroccan, but it is my favourite way to make couscous and the only recipe I have served for years with Moroccan or Middle Eastern entrées. I have adapted it from a recipe in Bonnie Stern’s “Simply HeartSmart Cooking”. This pilaf will make a superb accompaniment to many of the other dishes I plan to present in this series. I really hope you enjoy it! Place couscous in an 8 inch baking dish. Sprinkle with salt and cover with the boiling water. Cover tightly with foil and let stand for 10 minutes until the water is absorbed. Fluff gently with a fork. Set aside. In a large skillet, heat the oil and add the red oinion. Sauté the onion gently until soft. Add the cumin, turmeric and cinnamon and cook for 30 seconds until fragrant. Add tomatoes and cook over medium heat until mixture is very thick. Add raisins. Add vegetable mixture to the couscous and toss gently. Adjust seasoning to taste. Serve with vegetable, meat or seafood tagines. How is possible to not enjoy your recipe??? I always have couscous at home, I’m happy to learn as much as possible new recipes! Well, I’m so happy you have learned a new recipe from my blog! I really hope you enjoy it when you make it. Thanks so much for visiting and taking the time to make a comment. Cheers! Hey there! So glad I could offer a different way to do couscous! It is so versatile. I did read about your blog party, and was thinking I would like to join in the fun (I love a good party 🙂 My favourite thing to bring to parties is food, of course…I just hope I have the time to make something that everybody will enjoy 🙂 Hopefully, you will see me on Friday. Thanks for organizing, by the way! Cheers! A really lovely dish with a great combination of flavors and textures. I usually stick to couscous with dates, almonds, and herbs, but this recipe makes me want to try something new! Wow, dates, almonds and herbs sound awesome too! I will try that the next time. 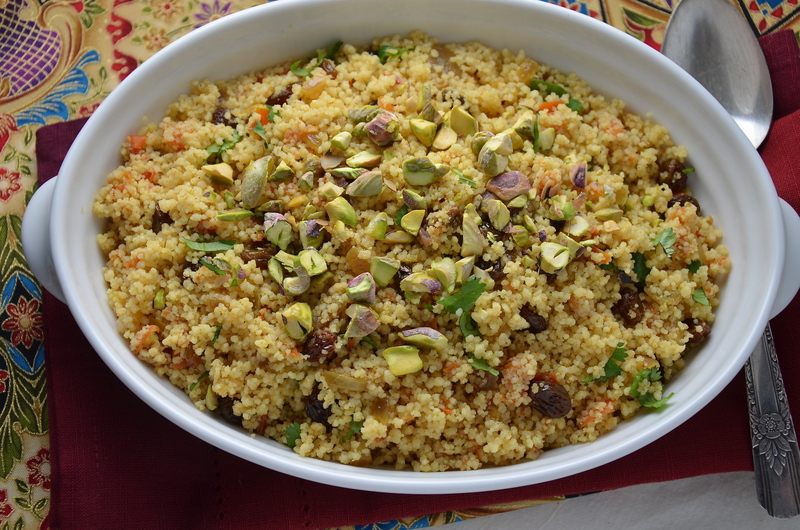 Couscous is so versatile, don’t you think? Julianna, your couscous looks delicious and I love the picture. Thanks so much for your kind words! I hope you have a wonderful week! This sounds really good! I don’t think I’ve made anything with couscous yet, so I will need to try this! I sure hope that you do try it! It is really such an easy recipe to make and so delicious! Have a wonderful weekend! I never knew I could make couscous pilaff. I love the simplicity and the ingredients added. I have bookmarked it for my lunch one of these sunny days!